Content marketing is being viewed as the future of marketing, according to research conducted by the World Media Group. Marketing that’s driven by content is on the rise with almost half (45%) or marketers saying that over 50% of their campaigns are content-led. On top of this, 78% of all respondents and 85% of agencies said that they see investment in content marketing growing over the next few years. With so much focus being put on SEO performance, these findings make sense, as more marketers aim to increase their rankings through the use of targeted and SEO-focused content. 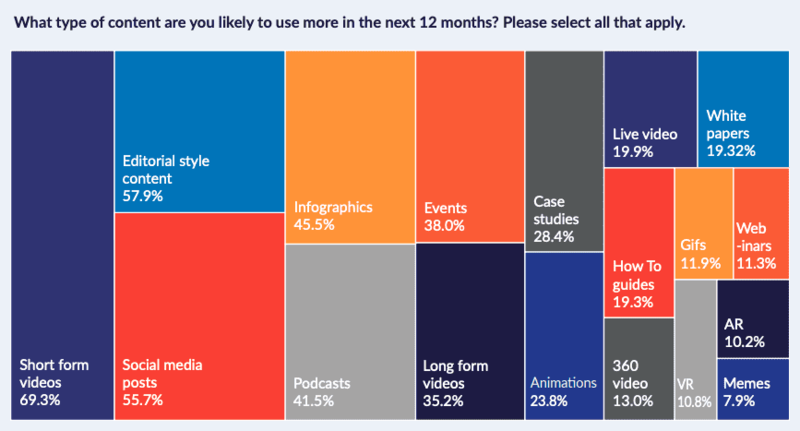 The survey revealed that the next 12 months will likely see an increased use of short-form video, making this one of the biggest marketing trends for the year ahead. A total of 69% of survey respondents said they are expecting to make use of short videos more across their campaigns. When you consider the fact that viewers retain 95% of a message when they watch it in a video compared to only 10% of the message when it is read, it’s no wonder marketers are seeing the benefits of video. On top of this, 51% of videos are played via mobile devices, often through a social media platform, which makes shorter videos that catch the eye when scrolling through a feed an effective choice. However, while video is the trend to look out for, it isn’t the content type that marketers are most excited by. When asked what types of content excites them most, both virtual reality (VR) and augmented reality (AR) got the most mentions. These were followed by audio, podcast and voice-related content, along with increased personalization (such as chatbots) and the opportunities it opens. In fact, the growing impact of AI on content marketing was a hot topic among respondents. However, the survey shows that marketers are more focused on getting the basics right in this area rather than starting to consider any hugely innovative uses for AI. This means people are likely to be concentrating on aspects like better integration with marketing strategies and effective engagement. 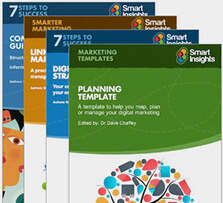 Many of the other forms of content that respondents are likely to use in the next 12 months are what you would expect to be part of content marketing campaigns – case studies, how to guides, editorial-style content and social media posts. While many marketers may be excited about advances in content forms, acknowledging the fact that tried and tested content types can be beneficial is also important. As well as content types, the survey asked respondents what factors lead to a campaign being successful. The survey revealed that marketers view the alignment of the brand, the focus of the content, the media partner and the target audience as being highly important. Some 66% said that audience and media alignment was one of the most important aspects when it comes to creating a successful campaign. Second to this was brand alignment, which was cited by 56% of respondents, showing that it is vital to create content that reflects the brand it is meant to market. As 49% of respondents said that content marketing campaigns are best for brand engagement, it goes to show that aligning the type of content with your brand, audience and media partner can help improve the effectiveness of your marketing efforts. The single most important factor to help ensure the success of a content marketing campaign was ‘the story’. Not only did marketers say this, advertisers came to the same conclusion, showing that the way to present a message is seen as being more important than the message itself. 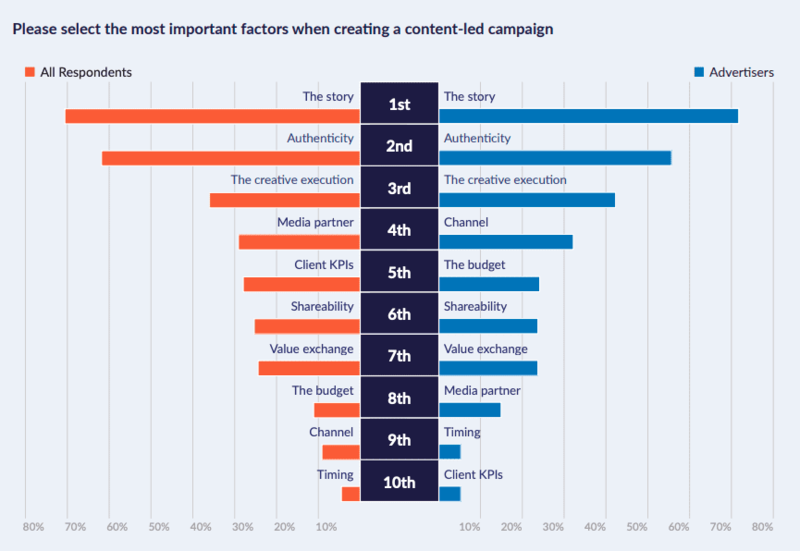 The idea of getting the story right also tied in with the second and third most important factors for success: authenticity and creative executive. Ensuring that your story is aligned with your brand – right down to the design and how it is executed – and is viewed as authentic can help you create an emotional response in your audience and start to lead them toward becoming brand advocates. Interestingly, while advertisers said the choice of channel was an important success factor – placing it fourth in the list – this was seen as being a lot less important for content marketing campaigns by respondents overall. This suggests that marketers may not be tailoring their content for the channel, which could have an effect on engagement and audience reach. It looks like content marketing is going to be a big investment for a large majority of marketers. Only 4.5% of respondents said that content-driven campaigns will decline over the next two years, with just under 78% predicting that more campaigns will be led by content during this time. 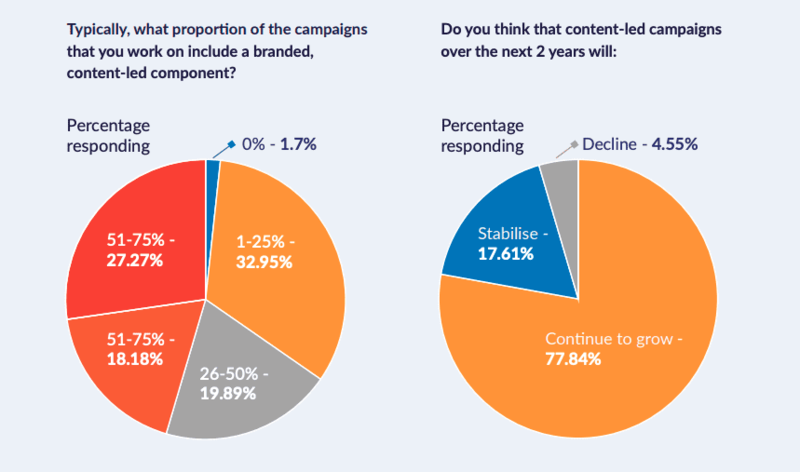 Almost 18% predicted that the next 24 months will see the use of content-led campaigns will stabilize, perhaps due to the large monetary investment certain content forms entail. It could well be that budgets remain the same but are invested in different ways, leading to fewer content marketing campaigns overall. It also looks as though content marketing could be used for increasing brand engagement more in the future, with 49% of respondents saying that they believe content-led campaigns are for doing this. As just under 26% said that the main KPI for their most recent content campaign was to increase brand awareness, it suggests that engagement might be something they want future campaigns to consider. This also shows that marketers need to consider better aligning the KPIs they use to measure success with what they perceive as being the best outcomes for content marketing.